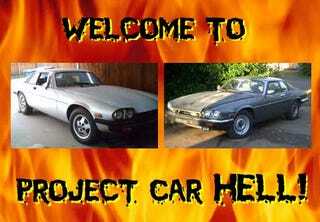 Project Car Hell, V12 Jag Edition: '76 or '87? Project Car Hell: Firebird or Capri? Say what you will about Jaguars, but any car with a freakin' V12 is inherently cool. I've been seeing the occasional Jag 12 in the junkyard lately, and I'm always awestruck at how ridiculously huge that engine is in person. Imagine how much fun that monster engine will be as you're trying to coax some life into this '76 XJ-S! And- can you believe it?- the price is a stunning five hundred bucks! The seller claims not to have even attempted to start the engine (translation: spun bearings and/or burned valves), but the glass is all good! The interior, however, is described as "brittle," by which we assume any surface you touch will crumble like pie crust beneath your fingers. And, dang it, there's some body rust. And every component that has ever touched gasoline is bad. But come on- the toll at the gates to Project Car Hell is low, and the glory of driving this beautiful car with a Vee-Goddamn-Twelve (preferably bellowing through straight pipes) might someday be yours! The 70s Jag XJs are pretty and all, but you might want to consider getting something that'll make you feel like a crooked S&L owner squandering his ill-gotten gains. Yes, those feathered-hair 80s babes will be on this '87 XJ-S like ants on candy! Definitely worth spending an extra $500 over the '76, we say! Sure, it has a fuel injection system made by The Prince of Darkness himself, and simply changing the spark plugs- which you'll need to do frequently- will take weeks of knuckle-shattering labor. And if you're the glass-half-empty sort, you might scowl at the seller's statement that it "will start and ideal but the engine won't rev." The interior is rough and the paint is ugly, but it will "smoothly go into gear" and it has a new distributor cap, so there ya go!